The Grade 1, $1,000,000 Pacific Classic has a field of 10 horses going a mile and 1/4 on the main track. The field is led by Beholder, the great mare with the 3.6-million dollar bankroll, who is attempting to become the first female to win the Pacific Classic. She is 5-2 on the ML. According to the TimeformUS Pace Projector, the early leader will be Bayern. Midnight Storm is shown in second place, followed by Beholder and Catch a Flight. The highest Late Pace rating in the field belongs to the longshot Class Leader. Class Leader (15-1): Has had a difficult time breaking through his NW3X allowance condition. If he manages to break through it in the Pacific Classic, we will be surprised, to say the least. 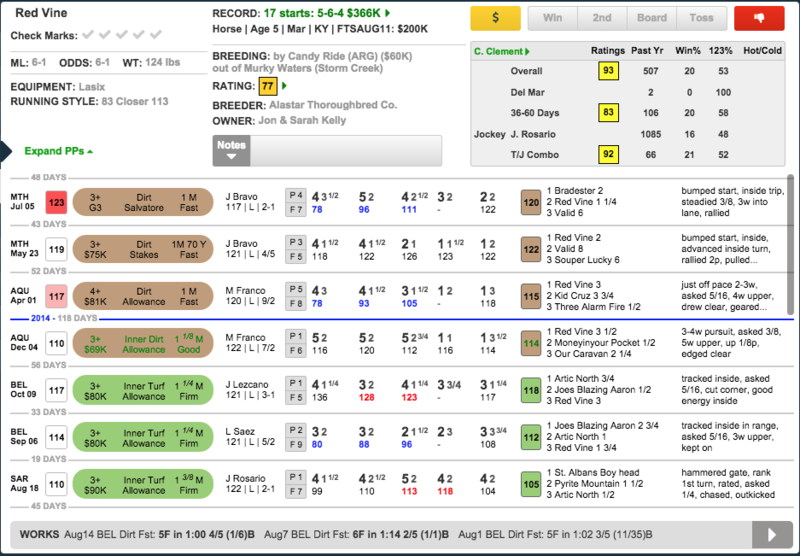 Bailoutbobby (20-1): Ran a nice race in a Grade 3 marathon a month ago, earning a speed figure of 117, but this hike in class seems too much to ask. Hyper-talented, enigmatic colt is unpopular in some quarters but his talent seems undeniable, as does his penchant for tossing in some awful efforts. 6 for 13 lifetime, he has run five speed figures of 120 or higher. He is proven at today’s distance and class level. Pace Projector shows him on a clear early lead. His best speed figures are best in this field. He comes in off a figure of 122, earned in a Grade 2 in which he finished third after running on a rail that was not the best part of the racetrack. A contender. 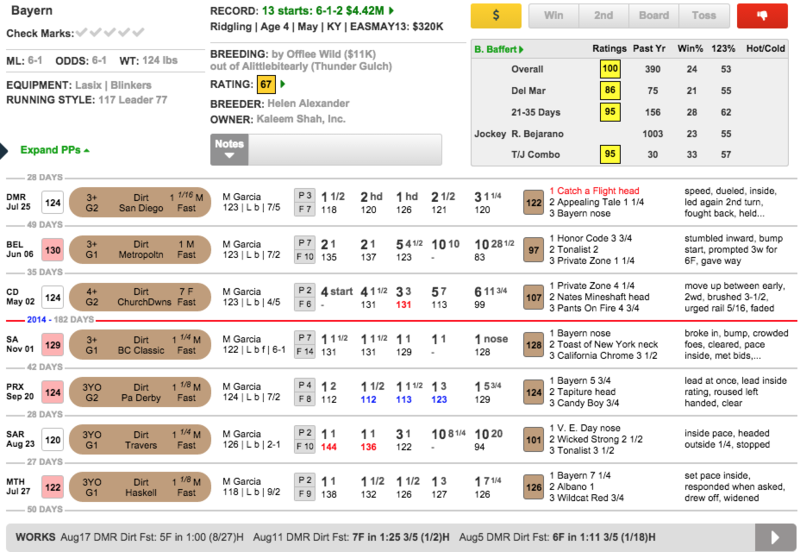 Hard Aces (5-1): Late-runner got a fast pace in the Gold Cup (note fractions and pace figures color-coded in red) and got up by a nose at 7-1, earning a lifetime top speed figure of 119. 6 for 23 lifetime, he is proven at today’s distance and class level. This will be his first start on today’s surface. His speed figures are moving in the right direction at age five. He deserves to be called a contender, though he is not at the top of our list today. Since getting on dirt for the first time, in December, this horse has put together a strong series of races. He won three, finished second in the other, and earned speed figures of 114 115 122 and 120. 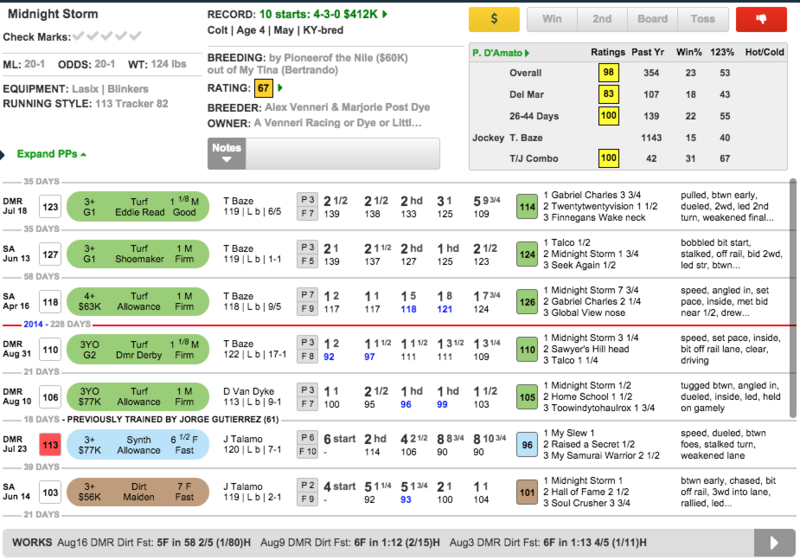 He gets tested for class today, but it is worth noting that the Race Rating for the Grade 3 he exits was a 123, one point higher than the preliminary Race Rating of today’s race. Although we are disinclined to take that literally, it does indicate that he exits a live race. And he was up against a speed bias in that race, as denoted by the Race Rating Box being color-coded dark red. Master trainer Christophe Clement sees fit to raise this one to the highest level today, skipping the intermediate steps of winning Grade 3s and Grade 2s, and on our speed figures, this roll of the dice is justified. This is a talented horse who will have no trouble with the distance. We’ll see how he reacts to racing against legitimate Grade 1 horses. This is the type of thing one finds out only when one finds out. Imperative (12-1): Talented but inconsistent gelding has run a few numbers that can do some damage in here and gets a very big barn switch as he moves into the barn of ace trainer Richard Baltas (trainer rating of 85). Making a case for him winning this race is not easy. (It would be easier if the race were being run at Charles Town.) But the case would involve speculating about a fast pace and a top speed figure off the trainer switch. Catch a Flight (9-2): 10 for 17 lifetime, this thoroughly admirable Argentina-bred has fired his shot in every single race he has run in this country. His last three speed figures are 118 118 119. He has a pleasing style that sees him setting up a few lengths behind the leader and going when asked. This is a style that allows horses to make their own trips. Catch a Flight is a contender, to be sure, and losing Gary Stevens, while picking up Flavien Prat, to us is a neutral development. Prat gets a 93 rating with Richard Mandella, and riders don’t get off mares like Beholder in the absence of extraordinary circumstances. Contender. 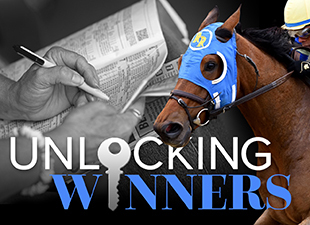 Hoppertunity (5-1): Baffert colt has now lost four straight since appearing to be coming into his own this winter. However, one of the losses was a heartbreaker, and he has continued to run solid speed figures. Proven at this distance and this class level, he will be making his second start over this surface. What gives us pause about Hoppertunity is our concern that he finds himself stuck at a level that will not quite cut it against the very best horses. Or to put it a different way, if Bayern fires his best shot today, we have a hard time seeing Hoppertunity beating him by firing an even better shot. To us, Hoppertunity is a horse who needs a little bit of cooperation from the best of his opponents. Beholder (5-2): Hall of Fame rider on a timeless mare who is trained by a Hall of Fame trainer. Quite a package, this one. Beholder’s resume is such that it needs no further promotion from us. But the question is what she will do today, at relatively short odds, as she makes her first start against the boys and her first start at a mile and 1/4. Our feeling is that while she is definitely a contender who has every right to win this race, she figures to go to post as an underlay and she is best played against today. We can understand why Richard Mandella has her in this spot. Indeed, we would have her in this spot too if she were ours. She exits a Grade 1 that she won in a cakewalk. 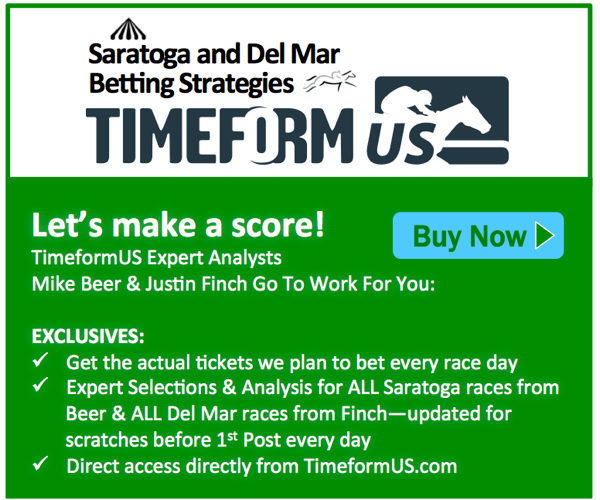 But what concerns us about Beholder at low odds is that on our speed figures, she is not quite what she once was. Her victory in the Hirsch, to our minds, was made to look more impressive than it was by virtue of the race hollowing out behind her. We have her effort as a one point regression from her two previous starts this year, and we don’t love that as a launching pad for her shot at the Pacific Classic. What is more, we don’t love the extra distance here. We see it as more likely to prove neutral or a small negative than a positive for this brilliant mare—a mare who, one might add, has made a career out of turning negative predictions into nonsense. Has fired a couple of turf efforts that can play in here (figures of 124 and 126) but may very well prefer dirt and has to contend with Bayern on the front end. Still, there is some serious talent here, and he may be able to set up just to the outside of Bayern and get first run if that one falters. At 10F, there is a lot of time to gain position from this outside post before the first turn at Del Mar. Yes, his turf speed figures are faster than his dirt speed figures, but, looked at in the context of his whole career, there is at least a chance that this reflects development rather than surface preference. Not a big chance, granted, but a chance nonetheless, and given big odds (we think he’ll go off longer than that 20-1 Morning Line), one can argue for taking this chance. And having a trainer who gets a 100 rating going turf to dirt doesn’t hurt. In total, Midnight Storm is not the craziest bomb we have ever seen. Far from it. This is a trainer who enters races in order to win them. He has a lot of horse here. And the odds figure to be huge. Win bet on Midnight Storm. Use Midnight Storm and Red Vine in multi-race wagers.